On the 2nd of October, Dragon Gate held a show in Korakuen Hall. Generational rivals and former partners Shingo Takagi and BxB Hulk were teaming up one last time as Takagi is departing the company as a full roster member, they would face Eita and a mystery opponent. The last time a mystery opponent was announced alongside R.E.D for Dangerous Gate, was revealed as KAZMA Sakamoto, I personally don’t mind KAZMA, I think he’s a good worker and his general aesthetic fits the group but R.E.D needed someone bigger to fill the void that Takagi was leaving as the main heel in DG. This time, Eita made his way to ring, accompanied by members of R.E.D who had already competed. The lights went out in the Korakuen. PAC appeared behind Takagi and attacked. Stunned. Joyous. Shocked. Those were the reactions to the Geordie who has just returned to Dragon Gate for the first time in 6 years. Declaring himself different to the boy that they remember when he first wrestled for the company. Dragon Gate signing PAC is a big step for the company, when people are probably more concerned now with why he didn’t show up in New Japan or Ring of Honor. It is cause PAC has a history here. PAC arrived in Dragon Gate in 2007 before leaving for WWE in 2012. In that timeframe, PAC wrestled 474 times for Dragon Gate, as well as numerous matches with the international ventures such as Dragon Gate USA and UK, in comparison to the paltry 9 matches he worked for New Japan. It shouldn’t come as a surprise that PAC’s first appearance in wrestling in a year, since walking away from WWE, is in a Dragon Gate ring. He may have learned his craft in the UK but PAC was born in Dragon Gate. PAC immediately joining up with the heel unit signifies his intention with the company, for the foreseeable future, he’ll be wrestling for Dragon Gate as part of R.E.D alongside Eita, Ben-K, Big R Shimizu, Takashi Yoshida, Yasushi Kanda and KAZMA Sakamoto. Not only as he immediately joined up with the heel unit who in recent weeks have being going at every other unit, he directly targeted by name several upper echelon members of the Dragon Gate roster, YAMATO, Doi, Yoshino, BxB Hulk, having previously being in units with them, either World-1 or Junction Three, his sights are firmly aimed at them. PAC brings something new to the company now, he’s a wrestler with international recognition due to his stint with WWE. Press from all over have picked up and people have been giving their hot takes, but most importantly, PAC is here. At a time when others have left, some amicably, others perhaps not. This Geordie boy comes home with a name that is now on everyones lips, bringing attention to Dragon Gate in the process. You may have rather that he appeared in New Japan, but give Dragon Gate a try, I’m sure you’ll enjoy it. The two matches that he has been involved in that are on Dragon Gate Network have both being exceptional quality, the BxB Hulk & Shingo Takagi vs Eita & PAC and R.E.D vs MaxiMuM from today have both delivered. ~ Shingo Takagi has wrestled his final match as a full time member of the Dragon Gate roster. He was pinned in all 3 matches of this ‘final tour’. KAI at Dangerous Gate, PAC in the Korakuen and now, his generational rival, BxB Hulk today at Hakata. I wish him well, he left amicably. ~ A couple of title changes happened in Stardom recently. Mayu Iwatani, Saki Kashima & Tam Nakano defeated JAN for the Artists of Stardom title on the afternoon show in Nagoya on the 30th. Momo and Kagetsu went to a double KO, so neither title changed hands. On the evening show, Jungle Kyona & Natsuko Tora won the Goddesses of Stardom title by defeating Mayu Iwatani & Saki Kashima. ~ Dragon Gate have announced that Bandido will challenge for the Open the Brave Gate in November on the 6th, taking on Dragon Kid. PAC vs Flamita will also happen. ~ The main event for tomorrows Kings of Pro Wrestling event will be Cody vs Kenny Omega vs Kota Ibushi for the IWGP Heavyweight Championship. A new member of LIJ will be introduced. ~ Kotaro Suzuki defeated YO-HEY to win the Global Junior League. Katsuhiko Nakajima unsuccessfully challenged Takashi Sugiura for the GHC Heavyweight Championship. 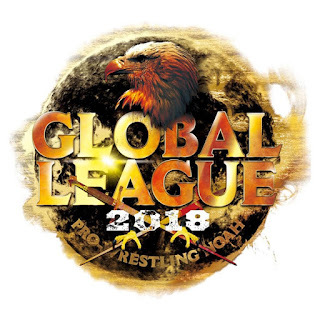 Competitors and blocks have been announced for Global League, the heavyweight tournament in Noah. They are; Naomichi Marufuji, Akitoshi Saito, Quiet Storm, Katsuhiko Nakajima, Kenoh, Masa Kitamiya, Mitsuya Nagai and Kohei Sato in Block A. Takashi Sugiura, Mohammed Yone, Go Shiozaki, Atsushi Kotoge, Kaito Kiyomiya, Maybach Taniguchi, Cody Hall and Kazusada Higuchi in Block B. Global League starts on the 30th of October.